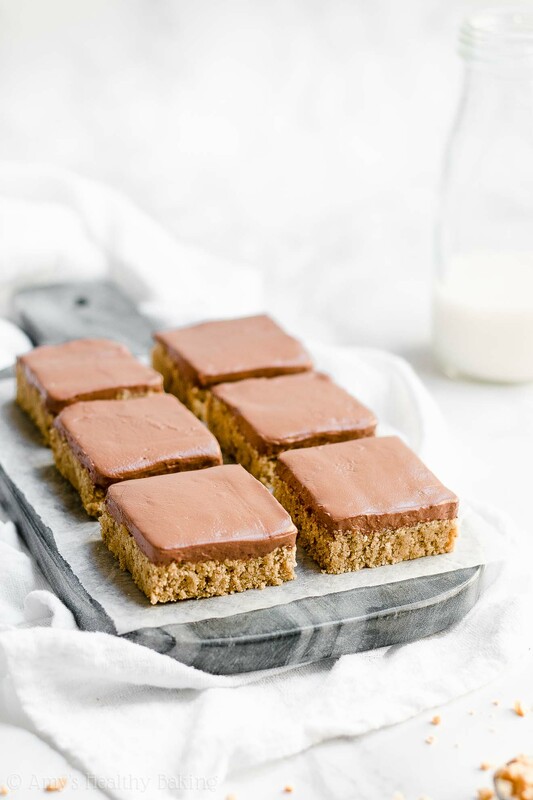 Learn how to make chewy peanut butter cookie bars with no butter, oil, refined sugar or flour! Topped with rich chocolate frosting & only 102 calories! For most Christmases while I was in middle and high school, my grandma drove across town to our house before 7 am. As a family of morning people, we gathered around the brightly lit tree in our family room and started opening presents first thing, usually before the sun rose. Grandma always tucked three large tins underneath the tree as soon as she arrived, along with a few smaller gift bags and envelopes. My brother and I waited impatiently until we could crack open the tin with our names on it… Because we already knew what hid inside! With dozens of sweets in each of our tins, we always shared with everyone else. We had more than enough to go around! Yet somehow, those buckeyes (spheres of sweet peanut butter candy dipped in chocolate!) always seemed to disappear first. While walking down the candy and nut aisle at the grocery store last week to pick up more cashews, I noticed a display of Reese’s peanut butter cups, and my mind ended up wandering to memories of Grandma’s homemade buckeyes because they shared the same flavors… And of course, I started craving buckeyes before I even walked out of the grocery store! 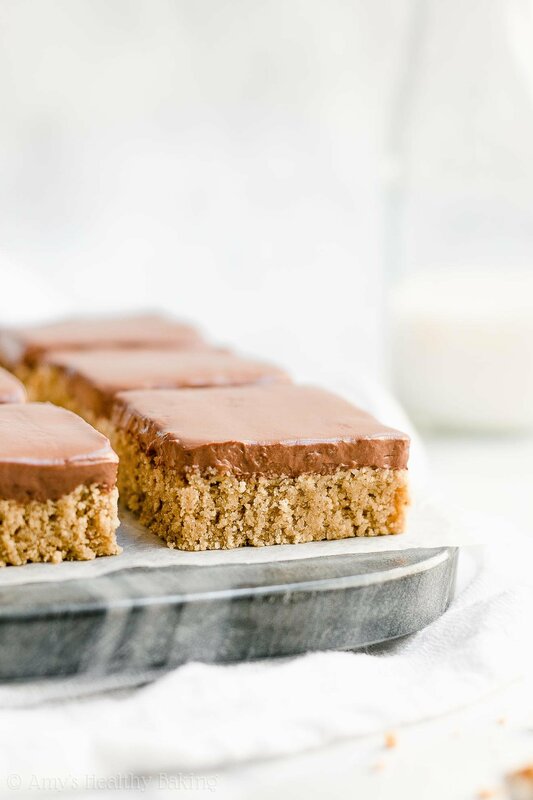 Yet because I felt too lazy to roll and dip dozens of candies, I baked a batch of these Healthy Practically Flourless Peanut Butter Cookie Bars with Chocolate Frosting instead! They have the same flavors, but they’re much less time-consuming to make! Unlike Grandma’s buckeyes, these also contain no butter, oil or refined sugar, and they’re just 102 calories! Sounds like total bliss to me! ? 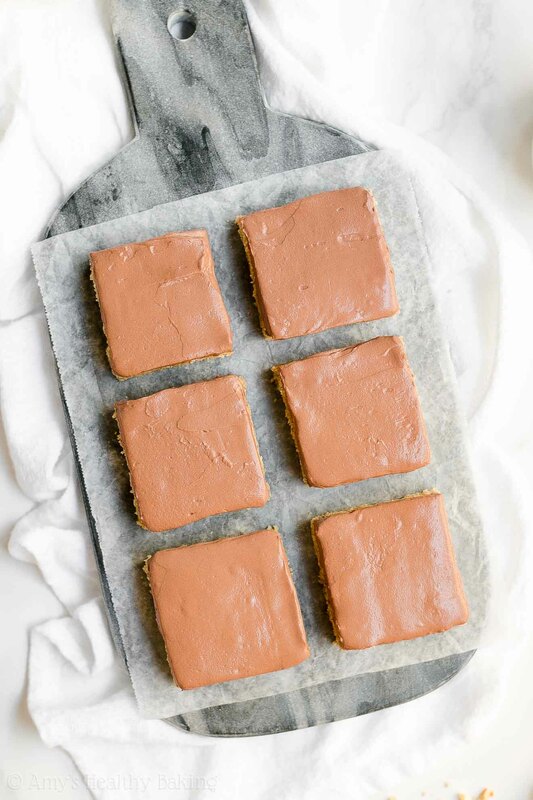 So let’s go over how to make these healthy practically flourless peanut butter cookie bars! I actually debated for a long time what to call them… Because you’re starting with oat flour (like this!). Oat flour is just finely ground oats. But somehow, “powdered oats” doesn’t quite have the same ring to it as “oat flour.” ? So what do you think? Flourless peanut butter cookie bars? Or practically flourless peanut butter cookie bars? Either way, they’re SO good! Soft, chewy, delicious cookie bar bliss. Tip: To make these gluten-free, use this gluten-free oat flour! I also show you how to make your own homemade oat flour here. Next comes the homemade creamy peanut butter! This is my homemade PB recipe. It just takes 5 minutes to make it (and you only need a blender! ), and it yields the best creamy peanut butter I’ve ever had. It’s much cheaper (and healthier!) than most store-bought peanut butter jars! You’ll skip the eggs in these healthy practically flourless peanut butter cookie bars. Yes, no eggs! Instead, you’ll mix in some unsweetened cashew milk. This is my favorite cashew milk! It’s so thick and creamy, similar in texture to light cream, but it’s only 25 calories per cup. I use it in so many of my baking recipes! To sweeten your practically flourless peanut butter cookie bars, you’ll use a combination of honey (like this!) and vanilla stevia (this kind!). If you tried to sweeten the cookie bars just with honey, that would add way too much liquid to the cookie dough… And your cookie bars would turn out with a bready, muffin-like consistency! So that’s why you’ll use half honey and half vanilla stevia! Stevia is a plant-based, no-calorie sweetener that contains nothing refined or artificial (aka it’s clean eating friendly). 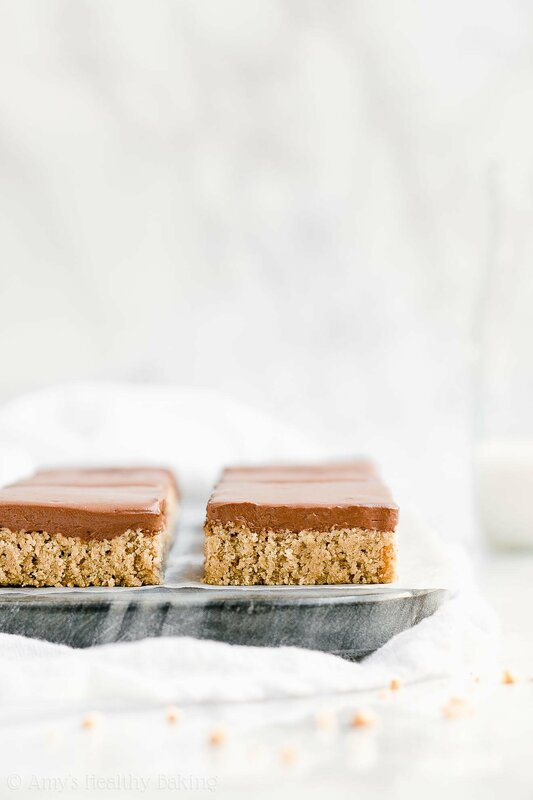 It’s also highly concentrated—you just need 1 teaspoon to sweeten these healthy practically flourless peanut butter cookie bars! That definitely helps keep them chewy… And low calorie, too! Once you’ve spread your cookie dough in the pan (remember to use a spatula!) and popped that in the oven, it’s time to mix up the healthy chocolate frosting. I couldn’t decide which part I liked better… The chewy peanut butter cookie bars or this frosting! It’s super simple to make! Just add Greek yogurt, unsweetened cocoa powder (this kind! ), chocolate instant pudding mix (this one! ), and a little more vanilla stevia (this kind!) to a bowl. Beat with a hand-held mixer for 2 minutes. Refrigerate for 2 hours and you’re done! It’s important to use regular unsweetened cocoa powder, rather than Dutched or special dark cocoa powder, in this frosting. That’s because regular cocoa powder has a stronger flavor, so it’ll shine through! The instant pudding mix is what thickens the Greek yogurt-based frosting so it’s a normal buttercream-like consistency. You can omit it if you’d like, but you’ll need to add extra unsweetened cocoa powder and mix the ingredients together by hand until they’re just incorporated. And enjoy! And when you make your own, remember to snap a picture and share it on Instagram using #amyshealthybaking and tagging @amyshealthybaking IN the photo itself! (That guarantees I’ll see your picture! ?) 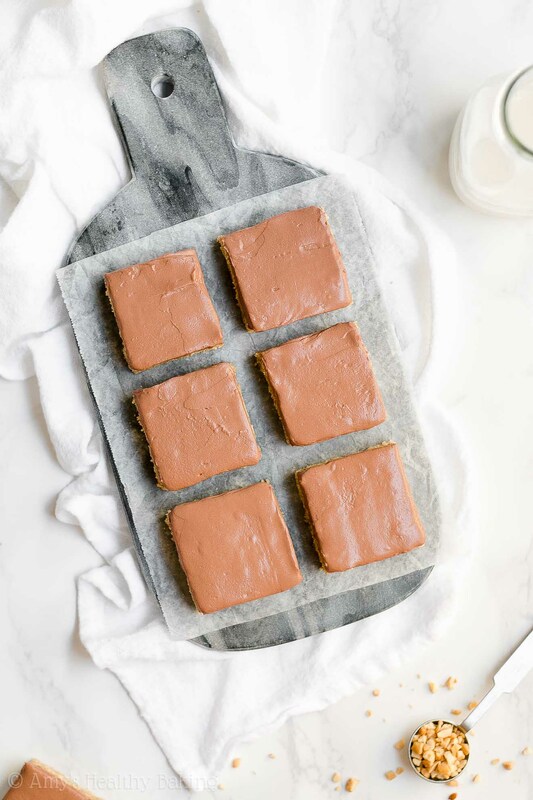 I’d love to see your healthy practically flourless peanut butter cookie bars with chocolate frosting! 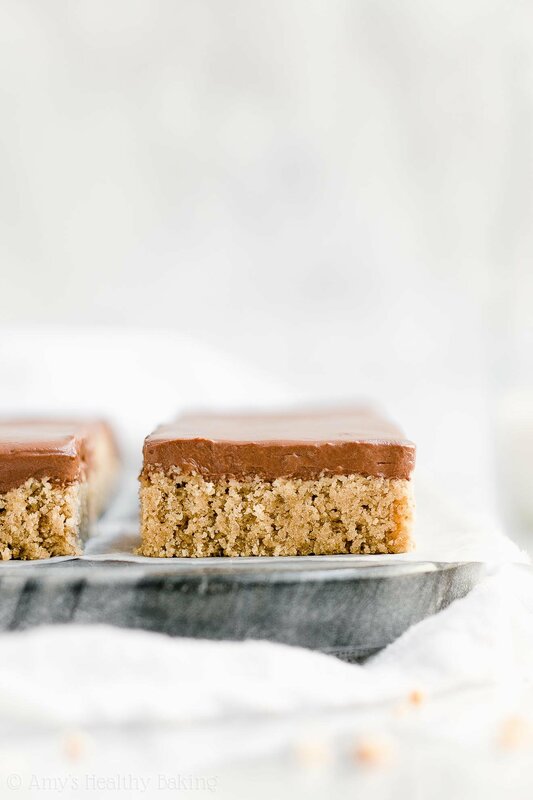 These cookie bars are perfect for anyone who loves buckeyes, Reese’s peanut butter cups, or any other chocolate + peanut butter treats. 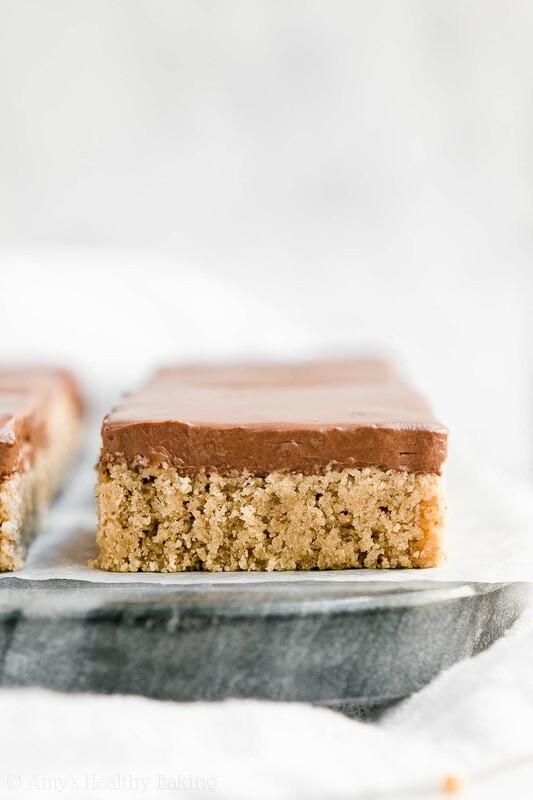 The peanut butter cookie bars are soft and chewy, and the rich chocolate frosting makes them even more irresistible! Leftovers will keep for at least four days if stored in an airtight container in the refrigerator. To prepare the cookie bars, whisk together the oat flour, baking soda, and salt in a medium bowl. In a separate bowl, whisk together peanut butter, cashew milk, and vanilla extract. Stir in the honey and vanilla stevia. Add in the oat flour mixture, stirring just until incorporated. While the cookie bars bake, prepare the frosting. Beat the Greek yogurt, instant pudding mix, cocoa powder, and vanilla stevia together using an electric hand mixer or stand mixer for 2 minutes. Cover the bowl with foil, and chill for at least 2 hours. Notes: I used this oat flour! (This is the gluten-free version.) You can also make your own. I show you how here! Be very careful when measuring the oat flour! Use this method or a kitchen scale. (← That’s the one I own and love!) Too much oat flour will make your cookie bars turn out dry or cakey, rather than soft and chewy. White whole wheat flour, whole wheat pastry flour, regular whole wheat flour, or all-purpose flour may be substituted for oat flour. For a non-oat-flour gluten-free option, use store-bought gluten-free flour blends (like this one!). This is my homemade creamy peanut butter recipe! You just need 5 minutes and a blender to make it. If using store-bought creamy peanut butter, make sure it’s the natural drippy-style kind that only contains peanuts and salt. Do not substitute crunchy peanut butter. I highly recommend using the vanilla stevia! It's one of my favorite ingredients, and you'll use it in all of these recipes of mine too. I buy mine online here because that's the best price I've found. You cannot substitute additional honey for the vanilla stevia because the cookie bars require a precise balance of wet and dry ingredients. However, you may substitute ¾ cup (144g) coconut sugar (or brown sugar or granulated sugar, if you aren’t concerned about keeping these cookies clean eating friendly) for both the honey and stevia, but the cookies will appear “speckled” if using coconut sugar because it doesn’t dissolve as well. If you prefer not to use the vanilla stevia in the frosting, then substitute 1 teaspoon of this powdered stevia OR 2-3 tablespoons of Truvia or granulated sugar. For a vegan option, substitute pure maple syrup or agave for the honey in the cookie bars. Then use this chocolate frosting recipe of mine instead, and substitute your preferred non-dairy milk. 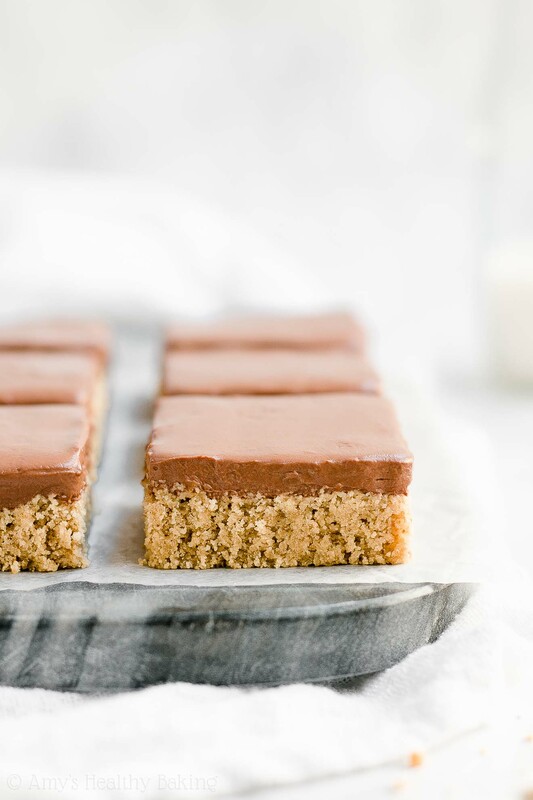 Call them Buckeye-Inspired Peanut Butter Cookie Bars ? I actually go over good alternatives in the Notes section of the recipe! I know it can be easy to miss. 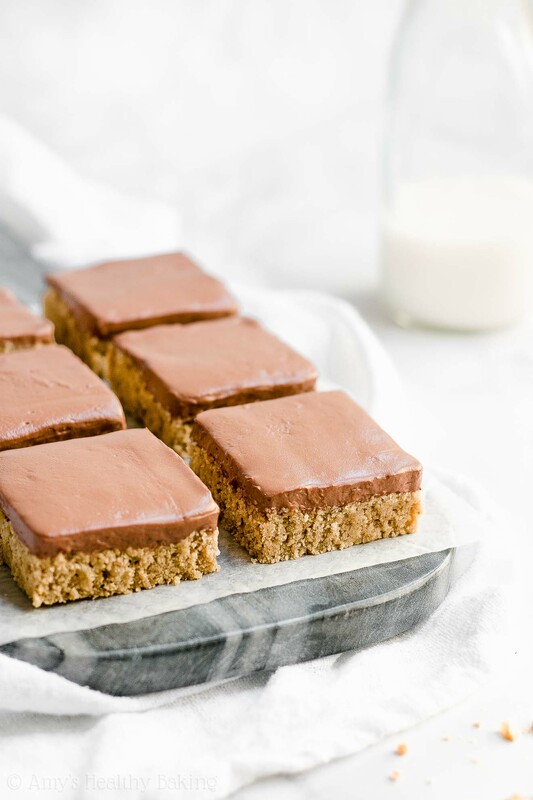 🙂 I’d love to hear what you think if you try these cookies bars Maha! These look great! Can we make our own oat flour? When can we look forward to some more savoury recipes? I’m honored that you’d like to see more savory recipes, Jan! I hope to share more in the future, but in the meantime, you can find all of my savory recipes by clicking on the “Recipes” tab in the pink menu bar at the very top of my website! 🙂 I can’t wait to hear what recipe you decide to try next! I really appreciate your interest in my recipe, Elisha! That’s actually the very first thing I go over in the Notes section of the recipe, which is located directly underneath the Instructions. 🙂 I can’t wait to hear what you think of these cookie bars! This is in the clean eating section but the pudding mix contains aspartame. I’m curious about your views on clean eating and artificial sweeteners. I try to stay away from any artificial sweeteners and was surprised to see this show up. I really appreciate your interest in my recipe Lynn! This recipe is in the clean eating section because I give a second fully clean (no pudding mix included!) chocolate frosting alternative towards the very end of the Notes section of the recipe, located directly underneath the Instructions. I know it can be easy to miss! 😉 I’d love to hear what you think if you try these cookie bars! I really appreciate your interest in my recipe Nadia! That information is actually included in Step 1 already. I know it can be easy to miss! 🙂 I can’t wait to hear what you think of these cookie bars if you try them!